Each year, many cattlemen and other livestock producers purchase cool-season forage seed they intend to use in autumn plantings. For various reasons, some of this seed doesn’t get planted (the most common reason being dry weather at planting time, which happens fairly regularly in autumn in the Southeast). 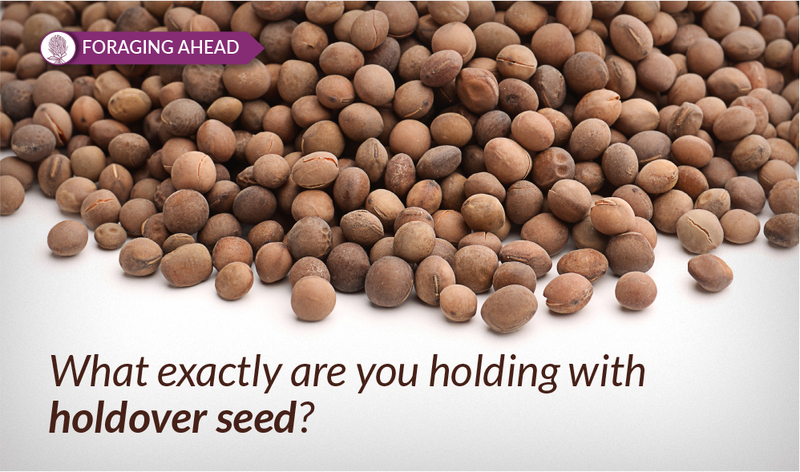 So when you have holdover seed, what do you need to keep in mind? That is, how good is it, and how do you know? A seed is a young plant that is in a resting stage. If stored long enough, seed will eventually die, and this is hastened by poor storage conditions. When the germination level of seed has dropped, seed death has occurred. Even in seed that will still germinate, some of the food contained within the seed may have been used during storage. If this happens, the resulting seedlings may have reduced seedling vigor (be weak and grow slowly initially). A number of factors can affect the likelihood of success of holdover seed. Legume seeds (seed of clovers, alfalfa, vetch, etc.) generally maintain viability longer than grass seed. When legume seed is stored in a favorable location, there may be little drop in germination level a year or more later. However, holdover legume seed should be inoculated (or re-inoculated) with Rhizobium bacteria just before planting. Though there are differences among species, the germination of most grass seed will drop significantly (often 30 percent or more) in one year’s time unless stored in a cool, low humidity environment. In general, winter annual forages should be planted in autumn, because seedlings that result from late winter or early spring plantings have little time to make growth between germination and the heading or blooming date. This is especially true for winter annual legumes such as arrowleaf clover, crimson clover, and ball clover. Annual ryegrass planted in late winter can sometimes make a reasonable amount of growth depending on location and weather conditions. The likelihood of substantial forage production with a late planting is better with a late maturing ryegrass variety and also better in the Deep South (i.e., Florida or the southern portions of states such as Georgia, Alabama, Mississippi and Louisiana). Small grains planted at this time can make some forage growth, but usually not enough to justify the expense. In Deep South states like Alabama, alfalfa usually does best when planted in autumn, but farther north, late winter or early spring is generally considered to be a better time to plant. Similarly, the perennial legumes white clover or red clover should normally be planted in autumn in the Deep South, but late winter/early spring is preferable when these legumes are planted into cool season perennial grass sods farther north. Planting tall fescue or orchardgrass in late winter can sometimes be successful, but late summer/autumn is clearly preferable. The likelihood of success when planting holdover seed of these perennial legume or grass forage crops in late winter is not great in the Deep South, but does increase as you head farther north. The higher the germination level of seed when put into storage, the higher germination level is likely to be when it is taken out of storage. Seed having low moisture content stores best. A level of 13 percent moisture or less is usually considered acceptable, with 6 to 8 percent being considered optimum for long-term storage. The lower the temperature and humidity in the storage location, the better the seed will maintain viability. Holdover seed should be stored in a cool, dry place; ideally, no more than 60 degrees F and 60 percent relative humidity. Other things being equal, a relatively constant temperature results in less damage to seed than fluctuating temperatures. Even under optimum storage conditions, seed viability will decline as length of the storage period increases. Obviously, seed must be protected from damage by pests during storage. Steps that may need to be taken depend on the type of seed, length of the storage period, and storage conditions.